Almost all ecommerce brands require shipping labels. Many use product labels. And some add decorative, brand building stickers to their ecommerce packaging experience. Because stickers and labels are typically an accessory to one's ecommerce packaging solution, they are often overlooked when companies are greening their packaging. But stickers and labels are typically made with virgin plastic. Even paper-based stickers and labels arrive on a release liner, which is generally made with 100% virgin supercalendered paper that contains a silicone (i.e. plastic-based) coating. Here, we explore traditional release liners and facestock, and recommendations for eco-friendly, plastic-free alternatives. What's a sticker or label release liner? Release liners hold stickers and labels before they are ready to be applied to a surface. The majority of release liners for labels and stickers are made with virgin paper and a silicone - i.e. poly-based - release coating. Technically, standard release liners can be recycled but they are extremely difficult to actually recycle and curbside programs do not accept them. A handful of paper pulpers (like Fox River Fiber Company in Wisconsin) are able to de-siliconise liners so the paper can be repulped back into new liners. Additionally, waste-to-energy facilities like Convergen accept this material for production of fuel pellets. However, these companies only accept pallet loads of recycled liner at a time, and the liner must be shipped to them, making this recycling process expensive, energy intensive and feasible only for large label and sticker printing operations who produce enough waste to warrant this process. It is estimated that less than 1% of the 500,000 tons of base stock for silicone coated liners is recycled annually. EcoEnclose is thrilled to soon offer a unique Zero Waste Release Liner, which is made with 100% post-consumer waste recycled and is curbside recyclable along with other paper waste. These Zero Waste Release Liners do not contain silicone or any other equivalent type of poly-based release agent. Their release properties come from an extremely thin UV coating. In fact, you can write on these liners with a ball point pen! There are a host of stickers and labels out there that claim to eco-friendly. But when thinking about your ideal label material, you can't look at sustainability in isolation. Instead, you'll want to match the material and end of life characteristics of the label face stock with whatever it will be applied to. Rather than asking if a sticker is compostable or biodegradable or recyclable, think about the end of life of the total package. For example, if you're applying shipping labels to a paper-based mailer or corrugated box, your question should be "Is the label easily recycled along with all other paper?" If you're applying a branded sticker to a poly mailer, you'll want to ask yourself "Is the label easily recyclable in the plastic film waste stream?" If you are using a compostable plastic package, you'll want to find a label or sticker that is 100% compostable as well. Common substrates used for labels and stickers include industrial vinyl, polyester, BOPP (biaxially-oriented polypropylene), vellum, virgin paper, recycled paper, bioplastic and Biostone (a tree-free, stone-based material that feels like a poly-based sticker). A paper-based packaging solution (such as a paper mailer or corrugated shipping box): Look for a sticker or label made with paper and a Recycle Compatible Adhesive (RCA adhesive). Where possible, look for a sticker made with as much recycled content as possible. Because the optimal, and most likely, end of life scenario for paper based packaging is the recycling stream, it is important to look for recycle-friendly (rather than compostable) stickers and labels for these packages. A poly mailer or another recyclable poly-based package: Look for a BOPP sticker (biaxially-oriented polypropylene), so the entire package can be easily recycled either curbside or at a grocery drop off program. Unfortunately shipping labels are typically made with paper and are almost never BOPP, so this is only an option for decorate stickers or product labels. A certified compostable bioplastic package: Look for a sticker that is made with paper or a certified compostable bio-based material, uses a certified compostable adhesive, and compost-friendly inks. Vellum: Even vellum that is 100% recycled is typically made with plasticized cotton, so it has a thin poly-based coating on it, and the material is neither recyclable nor compostable. Biostone: Markets itself as a tree-free label that is made with stones. Biostone is made of calcium carbonate that is bonded using HDPE, a type of plastic. This mix of materials means it is non-recyclable. EcoEnclose offers a full line of 100% paper-based stickers, all using Recycle Compatible Adhesive, that are excellent plastic-free options for all paper mailers and corrugated boxes. Our sheet labels and custom branded stickers and labels are all made with 100% post consumer waste. 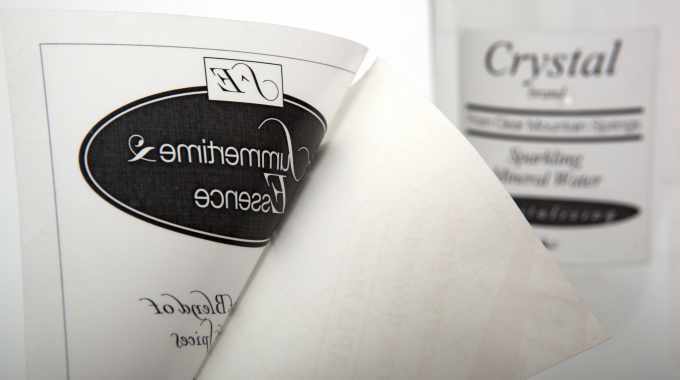 Our Direct Thermal labels are recyclable, but are made with virgin paper. Thus far, it has not been feasible to produce a paper with recycled content that still has the characteristics required for direct thermal printing (heat sensitivity). Available late February 2019! EcoEnclose is thrilled to soon offer the most eco-friendly labels and stickers available today, all of which feature a unique release liner that is free of silicone, 100% recycled and recyclable. 100% Recycled Shipping Labels with Zero Waste Liner: White laser sheet shipping labels made with 100% post-consumer waste on our recycled, recyclable release liner. Available in two sizes. 100% Recycled Stickers and Labels with Zero Waste Liner: Custom branded stickers printed on facestock made with 100% post-consumer waste, using our recycled, recyclable. Available in a variety of shapes and sizes, with limitless custom options also available. Direct Thermal Label Rolls with Zero Waste Liner: Direct thermal paper-based labels (the facestock is virgin material) are on our recycled, recyclable release liner.